Did you know that Montrose Golf Links is considered to be the sixth oldest course in the world? Records state that golf has been played here since 1562, but the first golf club wasn’t formed until 1810. In 1845 Prince Albert granted the club royal patronage. Royal Montrose is the 3rd oldest existing royal club in the world; only the Royal Perth Golfing Society and the R&A predates it. There are now three separate golf clubs playing over these ancient links, overseen by the watchful eye of the Montrose Links Trust. Mother Nature probably designed the original Medal course, and at one stage the layout was unique in that it boasted 25 holes. But in 1901, Old Tom Morris made alterations and two years later Willie Park Junior made further modifications. Despite many more recent developments, several of the Medal's opening holes are played over the same centuries-old linksland. The Medal is a traditional Scottish links course with delightful crisp turf, dunes, whins (gorse to southerners), deep bunkers and tall wavy grass that changes colour and dances in the wind. The holes are laid out in an unusual T-shaped configuration. The front nine plays mainly along the shoreline and offers excellent views across the North Sea. Holes 10 to 13 turn inland before you head back home, towards the sea. A golfing trip to Scotland would not be complete without playing this nostalgic links course. It represents a fine golfing challenge; Montrose hosted the Scottish Professional Championship in 1967 and 1970 and Final Qualifying for the Open Championship held at Carnoustie in 1999 and 2007. Only on my 5th golfing trip to the region did I find time to play Montrose. Until then, our stays had been too brief or we had been too busy ticking off the big beasts. But, I am very happy I finally made it to Montrose. So, why should you find time for Montrose in your schedule? After all, there are at least ten other tracks which are either more convenient (based in St Andrews) or higher ranked. Firstly, the Medal course at Montrose offers more variety than most other tracks in the region. When I write this I think mainly of the difference between the holes placed on or adjacent to the dune ridge (holes 2-9) compared to the flatter and more gorse-constrained look of the holes in the 10-15 loop. Gorse bushes in bloom are pretty, but if they have to double as hazards, I prefer them late in the round rather than early. While I am at it, also consider doing what we did: playing a warm-up round on the shorter Broomfield course in the morning to straighten your driving and polish those tricky 50-100 yard approach shots your links game will need, before tackling the Medal course in the afternoon. The whole day was excellent value for money when we played it last week and we did not have to wait a single moment all day! Montrose epitomises everything that is great and superior about links golf. It’s a golf course that has every ingredient required to create a classic true links experience. This is a layout that will test every department of your game and one you will never tire of playing. This historically important venue owes much to the marvellous terrain that it is laid out over, pure natural linksland with high quality turf that initially takes you towards, and then along, the rugged coastline before leading you through more sheltered gorseland eventually climbing back to higher ground before culminating in one more descent from a high tee at the 18th as you complete a satisfying journey through the sandhills and whins of Montrose. The course lays down a strong marker at the very first hole, one that requires a straight drive between fairway bunkers before you play to a raised green at the summit of the gradually rising hill. It’s an imposing hole and one that certainly doesn’t allow you to ease your way into the round, especially when an East wind is whipping in off the North Sea. The next five holes are exhilarating links golf at its best. Sadly, the well documented coastal erosion problems that the main course has suffered over recent decades does not appear to be relenting and whilst golf has been played at Montrose for over 450 years it is unlikely some of the holes will see the quincentenary. Montrose will undoubtedly adapt and change over the coming years but if you want to experience the current course and layout then the erosion gives you a perfect excuse to visit in the near future! Something I would wholeheartedly suggest you do. Wonderful layout uphill to start and then along the coast for some lovely holes. Played it in 2015 and had a pleasant round. Three par 3’s of different challenges which will test the golfer. Some blind holes which look derivable but not recommended without ball spotters. I’m not a fan of gorse ‘in play’ particularly if there is no bail-out and neither will you be if you go left or right of 15th green- depending on your mood/score bash on or layup short. Recommended play 8/10. Ranked 47th is about right. Played 36 holes in late March - the morning round off the yellows and the afternoon one off the whites (refreshing to be allowed to choose one's tees).Absolutely loved the course - everything I expect from links golf. Particularly impressed with the bunkering which demanded respect from almost every drive and approach shot. No weak hole on the course - the par 4s varying from the drivable (wind behind) risk/reward 5th to the extremely challenging (wind against) 11th with gorse and bunkers everywhere. The two par 5's are very different but both great fun - trying to reach in two on the 15th was an adrenaline rush!Some have said that the outward nine (following the coast) is more 'interesting'. The front nine has the better 'looks' but I found the back nine more testing. Definitely the best value course I have ever played with a day rate and, with the exception of numerous holidays to Machrihanish, cannot remember a more enjoyable day's golf. The layout is a little unusual for a traditional links. The first hole heads to the sea and then holes 2 to 9 run more or less parallel to the seashore. From the 10th to the 15th the course runs inland in a T formation before holes 16-17 are again adjacent to the coastline with the 18th returning inland beside the 1st. The front nine is rather more interesting because it is in the vicinity of the seaside dunes whereas the home nine suffers a little from rather flat and featureless fairways. The Medal course at Montrose has stood the test of time fairly well. One of the best holes is the 154-yard par three 3rd. A very deep and wide gully lies between tee and green so there is nowhere to land your ball except on the putting surface. This hole can look a little longer than it looks and, being close to the shore line, it is at the mercy of the sea breeze. On the back nine, the 11th and 14th and 17th are all par fours of over 400 yards. The 18th is only a medium length par four but there are five bunkers surrounding the green and a further two on the right hand side approach area. Played this course in early October on a beautiful day without too much wind. Thought the course was superb in every aspect, tees, fairways, the first rough (as I was lucky enough to stay out of the deep stuff) and the greens. Great mix of holes typical links fairways where there's hollows and mounds everywhere. I will play this course every time I'm in the area. A great challenge and enjoyable scenery. 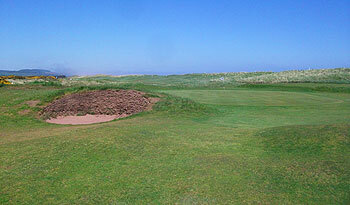 Played Montrose Medal late May 2012 preceeding a trip to Kingsbarns, expecting a mediocre gap filler. Was pleasantly surprised by what turned out to be a challenging yet friendly links experience. For a course that dates so far back the design and layout lends itself well to the modern game, with a number of holes playing over 400 yards (SI1 440) and many holes requiring length and accuracy off the tee. A superb variation in the par 3's ranging from 140 - 240 yards, a good mix of elevated tees, undulating fairways and dogleg par fours, help to make Montrose an interesting and strategic test of golf. Great time of year to see acres of gorse in full bloom.. A true delight as long as you don't hit your ball into it! Played the course in May on a warm,sunny but breezy day. The course was SUPERB. The greens were true and reasonably quick and a majority of holes on the front 9 were directly by the sea. If you strayed off the fairways you were undoubetdly in touble with bright yellow gorse. A great test of golf. I have played about 30 of the current British top 100 and struggle to see why this one is at 100 in comparison to some others I have played. The course wasn't fully open this time last year, potentially that was the issue ? We played at the end of March 2010 and found it in great condition, very friendly and excellent condition.